I saw this planter on Apartment Therapy and thought that I'd like to try to make it. I have a small stash of old sweaters that I've felted to make ready for all sorts of projects. Here is the sweater after I've cut it up a bit. 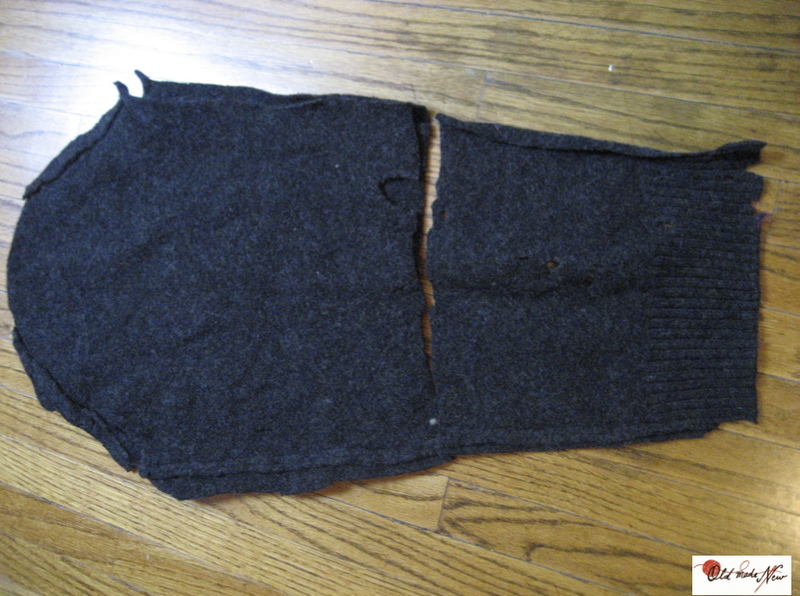 There were several holes in the sleeves and sweater body. 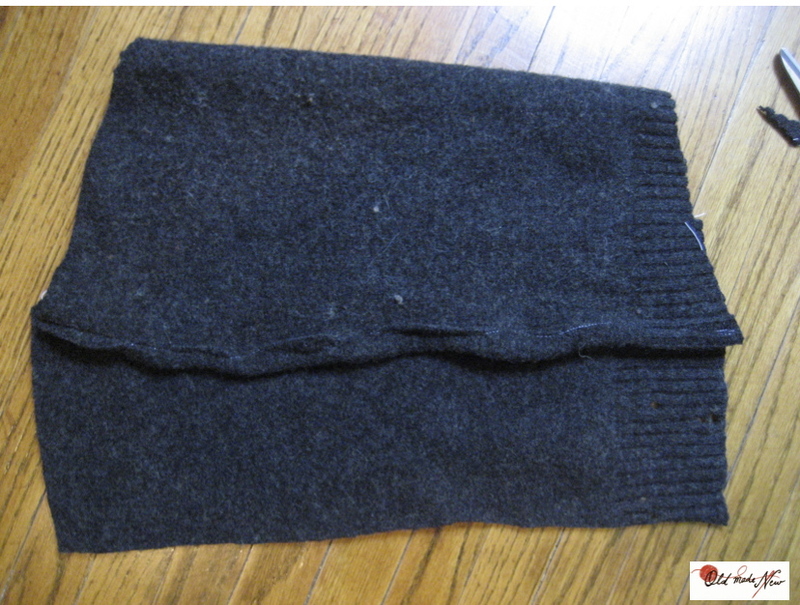 I flattened out the sleeves and cut off the part toward the cuff. 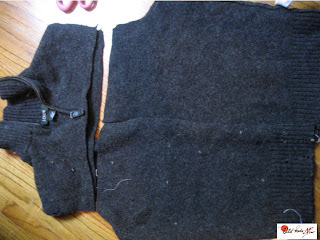 I sewed a hem into the top sleeve, sewed the two sleeves together, right sides facing each other, and turned it inside out. I left a three inch section on top for hanging hardware. 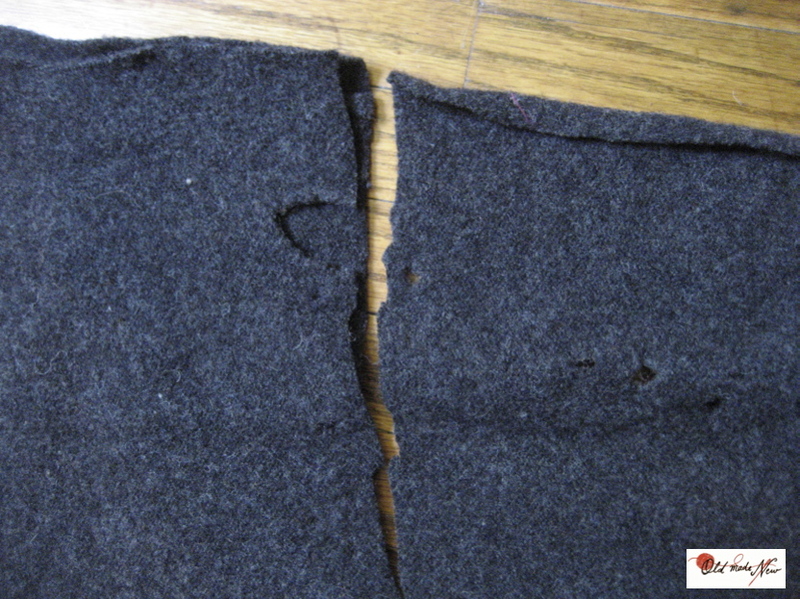 I flattened out the two body pieces and trimmed off the rounded part of the armhole. 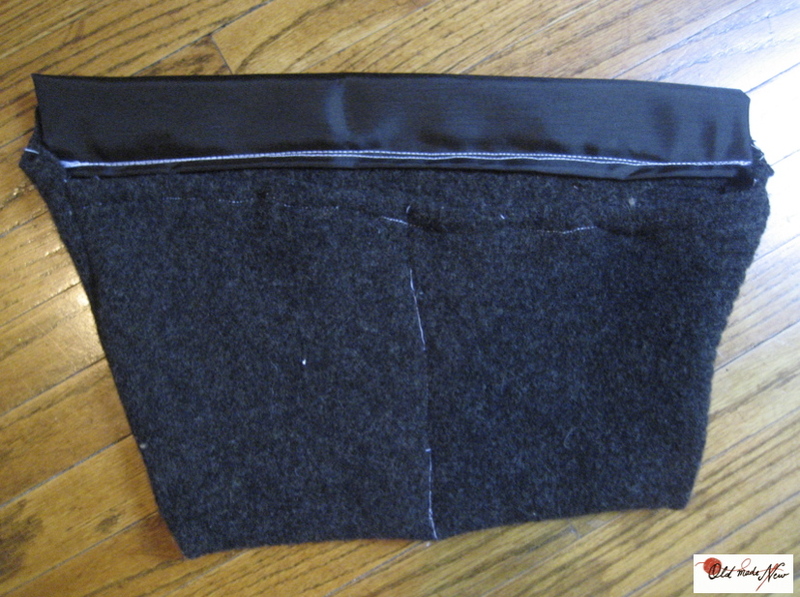 I hemmed one edge, then folded the piece up, leaving a three inch rectangle for hanging hardware. 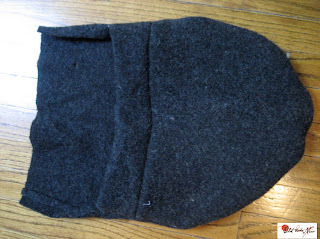 I sewed up the sides, turned it inside out and stitched up the middle, making two pockets. 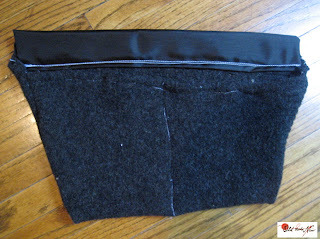 I also used a make-shift bias tape out of nylon to reinforce the hanging hardware. Here is one of the double pocket planters from the sweater body with grommets attached, allowing it to hang from simple hooks. I love grommets. 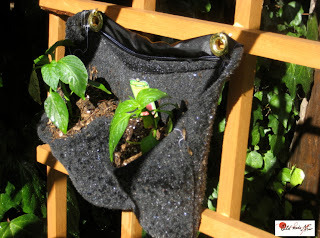 It's holding pepper seedlings. 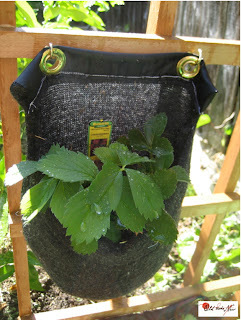 Here's the sleeve pocket holding two strawberry plants. 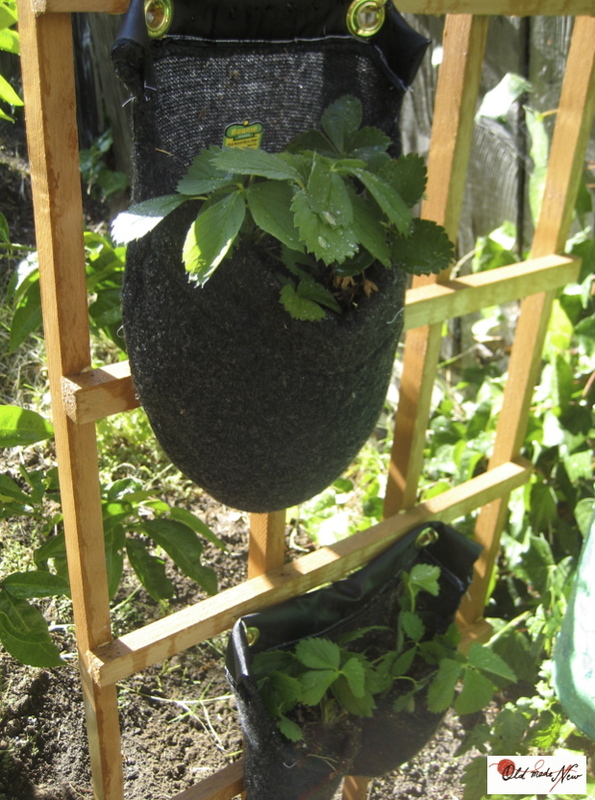 I'm really hoping that having the berries up high will keep critters from eating them before we have the chance to. 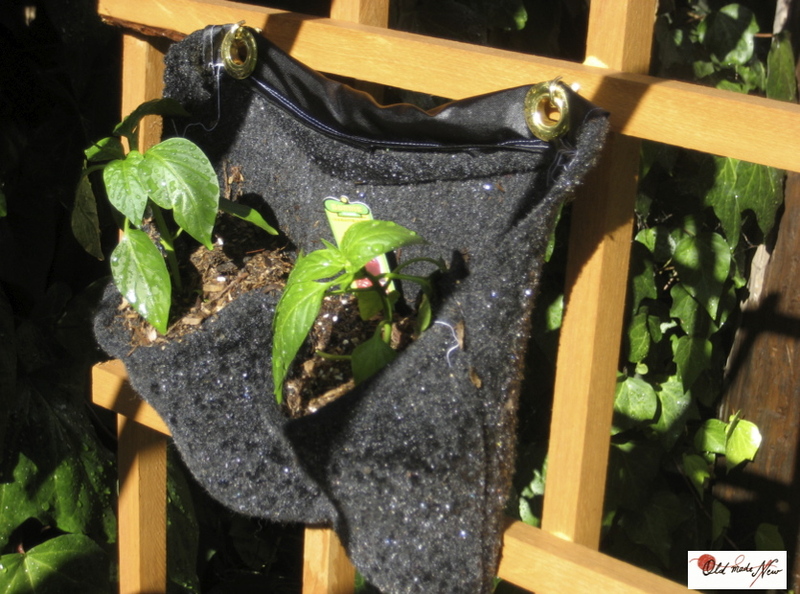 So far, the pockets are holding up well, draining at a slower rate than traditional planters with holes in the bottom, and aren't leaking out any dirt and mud. I'll be very interested to see how long they hold up, but considering that they were FREE (since I had all the supplies sitting around already) and only took one of my twins' naps to make, I won't cry if I have to remake them next growing season. Vintage patches hand sewn onto caps. I used to be an English teacher until I had kids...really fast...3 in less than 2 and a half years. I like to make stuff, especially for them, but, in order to fit all these kids into this tiny California bungalow, I try not to buy much. I like to use up and repurpose old materials. Also, the Pacific Garbage Patch and the fact that there are 3 public storage facilities within a mile from my house really freaks me out. There is too much junk in the world. 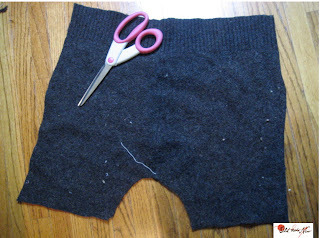 I hope this blog will keep me accountable to not adding to it too much.